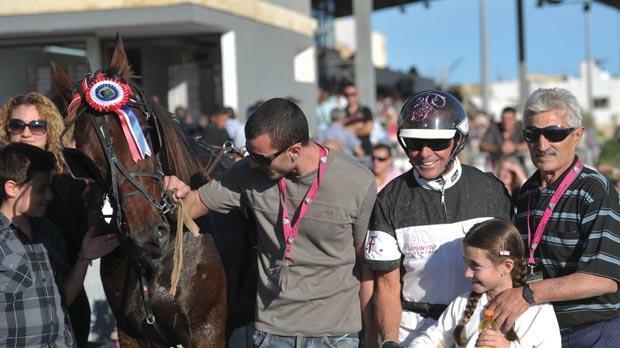 Veikko Hornline topped the opening semi-final of the Johnny Walker Cup at the Marsa Racetrack yesterday. Ten trotters booked their place in the Johnnie Walker Cup final, open for class Gold trotters, during yesterday’s meeting at the Marsa Racetrack. Veikko Hornline and Obelix Molgard topped the two semi-finals which formed part of the 34th meeting of the season. Ten horses took part in the first class Gold semi-final. It was Swedish Veikko Hornline (Julian Farrugia) which stormed ahead in the initial stages, building a length lead from P.A. Surprise (Lorraine Cunningham) and Sigurd Speed (Mark Tanti). Veikko Hornline managed to remain ahead throughout the distance to finish ahead of P.A. Surprise. Panda Des Fleches (Chris Cassar), Markus Clipp (Darren Mizzi) and Sigurd Speed were the other trotters to progress to the final. For Veikko Hornline this was its second successive win and the third of the season. A keen tussle between three horses developed in the final metres of the second semi-final. It was Danish Obelix Molgard (Salvu Vella) which notched its second victory of the year by a length from nearest challengers Reader JYL (Charles Camilleri) and Quito De Femisson (Kirsten Gialanzè). New Star DK (Noel Baldacchino) and Argus Hanover (Larson Mifsud) ended respectively in fourth and fifth place. In the class Gold race, Quartz Nay (Anthony Camilleri) stormed clear of the field midway through the final straight and registered its first win in Malta from newcomer Quomo Du Michallet (Brian Hili), Quoing A Man (Sam Cassar) and Regent De Tillard (Andrew Farrugia). Another meeting at the Marsa Racetrack will held on Friday. The first race, reserved for class Bronze trotters, should start at 7pm.